My love of tokidoki has been ongoing since they launched their makeup products at Sephora. Recently there was a lot of discounted products online so I indulged in a quite a few lip and eye products. I bought two Prisma Glosses, a Lip Ink, a Perfetto eyeliner and a third Cromatico palette. First of all how cute are the boxes that the Prisma Glosses are packaged in. The entire collection of Prisma Glosses is available at Sephora.com for $15; however for a limited time some shades are available for $7 which is the amount I purchased mine for. The glosses are very shiny and moisturizing. They have an amazing fruity smell which in their description is called blueberry; I'd describe it as somewhere between real blueberries and blueberry flavored candy. They are all topped with the character they are named for. When I opened the tube up, I was a little surprised to see the applicator which is a flexible plastic spatula. It applies the gloss fine and actually works better than traditional applicators at applying sheer, shiny gloss. Intense buildable lip color with innovative marker pen, available in five vibrant colors with a delicious mango flavor. The Lightweight formula contains moisturizing panthenol for healthy, hydrated lips. An airtight cap allows for effortless transport. This is the Fantastico Lip Ink in Cactus Friends it is available on the Sephora website on sale for $5. It's a vibrant lip stain that comes with a marker tip. The tip is very fine which allows for very accurate application on the edges of the mouth. The stain smells incredible. It's a very sweet but not overpowering peachy mango smell. 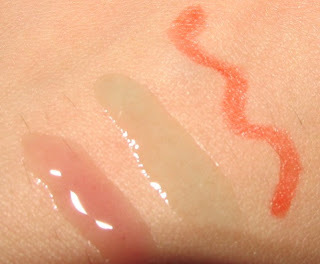 It is super- long lasting and took five through hand washings to come off after I swatched it.